4 Days of Food Drink and Fun on the Outer Banks of North Carolina. 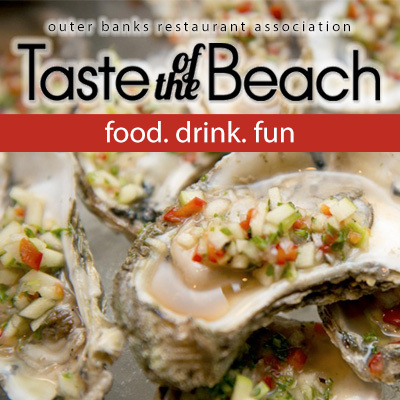 Make plans to join us for the Outer Banks Taste of the Beach event in March. Events and ticketing will begin in December. To be notified via email when events begin to post, please sign up for our email list. The Outer Banks Taste of The Beach Weekend is a fantastic way to sample the fare of many fine restaurants on the Outer Banks in one fun-filled, food-centric weekend! Casual chefs to full-on foodie fanatics will revel in innovative culinary opportunities offered up by members of the Outer Banks Restaurant Association. You can indulge in a fancy wine dinner one night and mix with the masses in an organic farm to fork experience the next. Or maybe an intimate cooking class with one of the area’s world class chefs is more your speed. We offer over 60 events over four days at nearly 40 different venues. This fun food festival event features: wine tastings, cooking classes, special multi-course menu presentations, brewery tours, tapas crawls, cook-offs, showdowns, and throwdowns, dine-arounds, and many more culinary delights! It’s four days of foodie heaven and lots of fun activities on the Outer Banks. It involves over 50 restaurants! The Taste of the Beach Grand Tasting, will be the hottest ticket in town with about 20 area restaurants and beverage vendors serving a sampling of original hand prepared foods, fine wines and beers from around North Carolina and the world. Restaurants will be competing for the Annual TOB'y Awards; Best Booth Presentation, Best In Show, Best Outer Banks Catch, and the two top awards, the Chef’s Award and the coveted People’s Choice Award. Outer Banks Taste of the Beach is brought to you by the Outer Banks Restaurant Association. Don't miss their popular Spring and Fall Outer Banks Restaurant Weeks too!